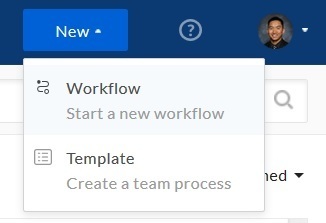 Once you or your coworkers have created a workflow template, it's easy to find and launch that workflow. You can launch any workflow that you own, or one that has been shared with you, a group that you are a part of, or your enterprise as a whole. You can also configure Relay to launch a workflow automatically. 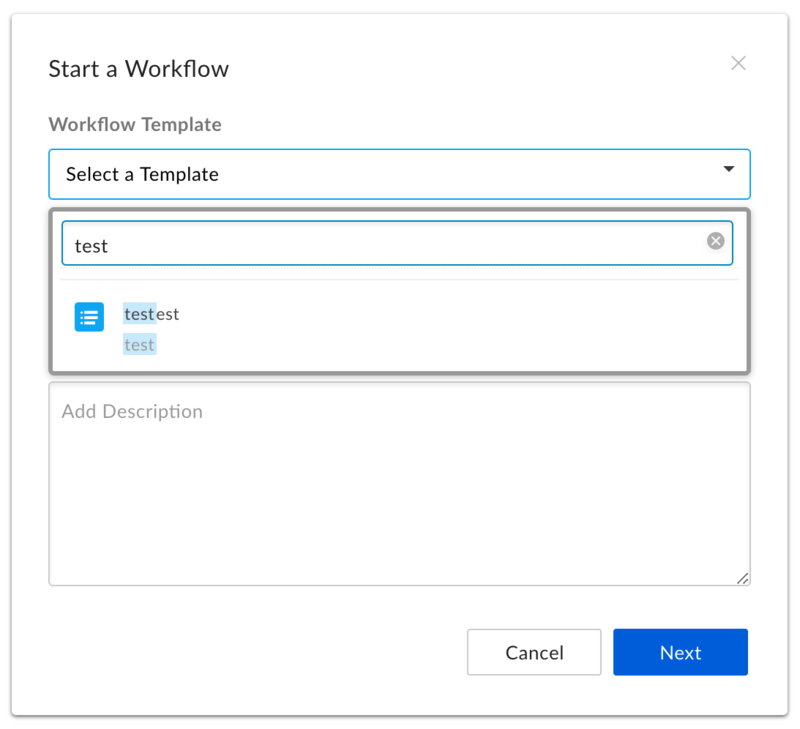 Before you launch a workflow, you should double check the workflow template you plan on using to ensure that the proper individuals are assigned to the corresponding steps and the due dates are correct. The easiest way to launch a workflow is to click the New button in the top right corner, then select Workflow in the drop down menu. In the box that appears, search for and select the appropriate workflow template. Note: Currently, you can only search for templates by name. Once you have selected the correct Workflow Template, enter a name for this specific workflow. A descriptive name is highly encouraged as you or other members of the workflow may have multiple but similar workflows and a descriptive name for the workflow can help alleviate any confusion. A description in this section is also optional, but encouraged. This is ideal to describe exactly what the workflow will be used for. You will now see an overview of your workflow. This is the last opportunity to review and add any information that may be missing from the workflow. You may also be required to add assignees or finalize other settings, depending on the setup of the workflow template. Is this the correct template to use? Are the steps in the correct order? Have all the steps been assigned an assignee? For the time sensitive steps, has a due date been assigned to those steps? For the last step, has a box folder been assigned for where the content will route to once the workflow is complete? Note: the assignee of this step can also add or change the Box Folder once the workflow has moved into the last step. It does not need to be added prior to the workflow launch. Once all the required fields are filled in, you can now launch the Relay workflow! Note: Relay will prevent you from launching the workflow if any required information (such as assignees) is missing.